Campers and hikers need foods which are healthy, lightweight, do not spoil, and do not cost too much. The foods should also provide healthy carbs, protein, fats, and electrolytes to make up for a long day of hiking. Good vegetarian camping foods include dried foods, nuts, and canned foods. Eating fresh fruits and vegetables when you get a chance is also good, but not practical for longer trips. The list below gives some suggestions for healthy and cheap hiking and camping foods for vegans and vegetarians. Edamame is one of the most balanced and nutrient dense foods around. High in protein, fats, carbs, and a range of electrolytes, edamame is a great choice to take with you on a hike. It is lightweight and cheap too, and makes for a great quick snack. 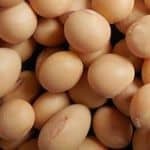 Nutrition Facts for Dry-roasted Soybeans. Pink shelled lentils will cook in 10-20 minutes. Just add 2 parts water per cup of lentils and boil for 10-15 minutes. Lentils are very high in protein, carbs, fats, and fiber. Nutrition Facts for Lentils (Cooked). Rice is a great healthy staple. It feeds over the half the world. Get par-boiled or precooked rice to save on cooking time. Adding vegetable based soup bouillon cubes can be a great way to add flavor and electrolytes. Just be sure to get lower sodium bouillon, without partially hydrogenated oils. Nutrition Facts for White Rice. Pasta is actually lighter than rice, and also cooks quickly. Like rice, adding soup bouillon cubes can be a great way to add flavor and electrolytes. Nutrition Facts for Whole Wheat Pasta. Traditionally eaten for breakfast, oatmeal is a great source of fiber, and healthy carbs. Add nuts and dried fruits for an extra boost of energy to last you longer into the day. Nutrition Facts for Cooked Oatmeal. Freeze dried herbs or vegetables make a great addition to rice, pasta, and lentils. Not only do they add flavor, they also add vitamins, minerals, and fiber. Nutrition Facts for Dried Oregano. While high in sugar, dried fruits are a great source of vitamins, minerals, carbs, and fiber. Be sure to brush your teeth or chew some dental gum after eating them to prevent dental problems down the road. Nutrition Facts for Dried Apricots. Whatever cereal bars lack in healthiness, they make up for in convenience and nutrition. For healthier choices in cereal/energy bars choose those low in sugar or refined oils. Better yet, try make your own with superfoods like flax seeds, quinoa, and chia seeds. Nutrition Facts for Rice And Wheat Cereal Bar. Nuts and seeds are great sources of fat, protein, carbs, minerals, and fiber. That said, nuts need to be stored properly to last a long time. They are also not the lightest or cheapest of food choices. Canned foods are not light, but are cheap and convenient. The are also a good source of protein and vitamins. Be sure to find canned foods with little to no added sodium and/or sugar. Nutrition Facts for Canned Green Beans.